PIG CITY: the economy of meat. In 1995, MVRDV was asked by the WELSTANDSCOMMISSIE ACHTERHOEK, a pseudo- arcadia in the East of the Netherlands, what to do with the ever-expanding pig sties that were desecrating the landscape. To give the readers some context, with the export of 16.5 million tons of pork, in the ‘90s the Netherlands was the chief exporter of pork within the European Union. To satisfy the domestic demand and export of porkers, the Netherlands had to produce 19 million pigs per year. In 1999, 15.2 million pigs and 15.5 million people inhabited the Netherlands and the total area required for current production equals 29 percent of the Dutch land surface: a shocking equation. As 75% of all pig farms in the Netherlands, 75 percent were concentrated in the provinces of Overijssel, Gelderland and North Brabant, something need to be done. MVRDV had an idea: why not stacking them in a few places in the region was simultaneously appreciated and scorned? Taking cues from the Dutch Pavilion for the World Expo in Hannover (2000, but designed since 1997), a composition of stacked landscapes, the Dutch architecture firm created Pig City, also as a response to the 1999 Pig Disease that struck Europe (200,000 pigs were put to death in the Netherlands alone. In May 2000, the Dutch pavilion opened). “Let’s assume the Dutch keep up with the current production level and instigate an organic production method. How can we combine this with the current need for land? Can this organic farming be combined with a further concentration of the production activities so that there will be enough space for other activities? How can we then redefine the pig farm in architectural and urban terms, further compressing the use of land to more adequate proportions? Can we compress the impact that pig farming has on the immediate environment and at the same time improve the quality of life for pigs?” asked MVRDV. 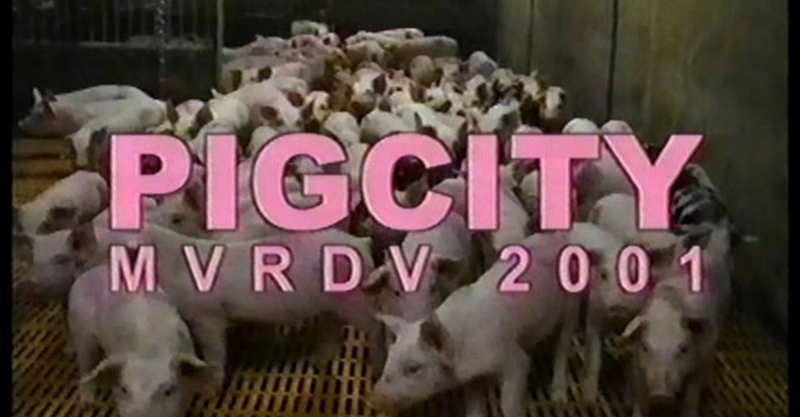 PIGCITY film converts the pig farm research that was produced for a book called “New Nature” into a film. It was later shown in an exhibition in Stroom, during which debates about the morals of meat production were organized.